Many electronic circuits dealing with audio amplifier circuits have been published here. This is just another one and here we use the TDA 1514 high performance hi-fi amplifier from Philips. The IC has a bunch of useful features like thermal protection, mute-standby facility, low harmonic distortion etc. The amplifier operates from a dual +25/-25 V DC power supply and can deliver 40Watts output power to an 8 ohm speaker. The audio signal to be amplified is fed to pin 1 of the IC and the capacitor C2 acts as a DC de-coupler. The resistors R3 and R4 determine the closed loop gain and it can be varied between 20 and 64 dB. Resistor R2 and capacitor C4 forms a Zobel network which corrects the loudspeaker impedance and improves the frequency response. Resistors R7, R6 and capacitor C5 are the boot-strap elements. If boot-strapping is not needed then these components can be omitted and the pin7 can be connected to pin 6, but the output power will be reduced by some 10%. R1 is the input bias resistor and it has an effect on the input impedance. Assembling the circuit on a good quality PCB will improve the sound quality. 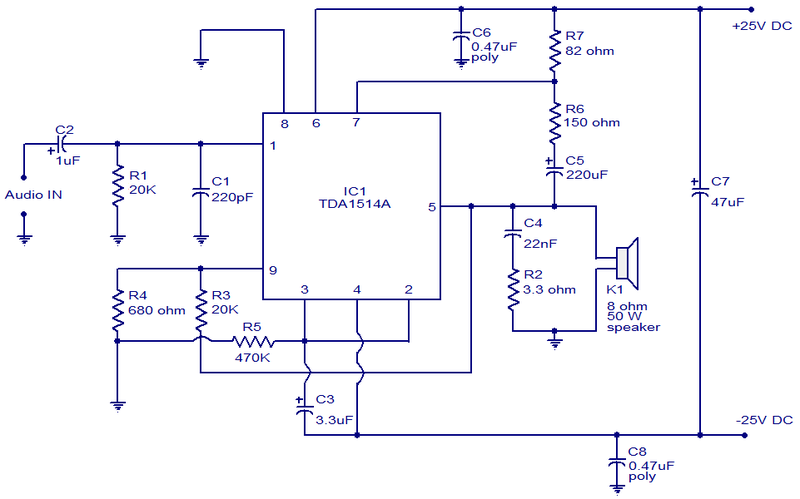 Use a +25/-25V DC, 4A dual power supply for powering the circuit. K1 can be an 8 ohm, 50W loud speaker. IC1 must be fitted with a proper heat sink. Hallo, I got power supply that have 24V +/- & 1Amp Current. Is it OK or i Have to feat a 24V +/- & 4Amp. 24V 4amp power supply is not in marker and any website delivery service is not able in my city. if my power supply is not enough for this circuit then I don’t make this for my Sub woofer. help me Please …..
Hi, need some help with this Amplifier circuit board. I am doing this as a hobby and need complete component list with all the ratings. As you have started online store i am glad to buy the components online. Also kindly quote an approximate price for the complete components. R6 should be at least 2watt, R7 & R2 1W, the others can be any size. I avoid carbon resistors in small signal (inputs) applications because they can be noisy. Hi Mr. Seetharaman can specify wattage of resistor which one is 5W,2W,1W 1/2W or 1/4W..
Hi Michael power supply filter capacitors should a minimum of 4700uF 40volts, one each for the positive and negative supply. Ensure the supply line from filter capacitor to IC board is wired with >1mm dia wire and not more than 4″ in length.Still if you have some RF interferece from any near by source include 2.2K ohms 1/4 resistance between R1 and C1 this with capacitor C1 will act as a HF filter. Hello sir, is there anyone from Bangalore where i can get some help ?? An input potentiometer for gain would be connected before C2, with the wiper going to C2. Use a 10k audio (log) taper, or if you want to use a high resistance, say 50k, change R1 to 50k and C1 to 50pF. C3 & C5 should be 25V, C7 at least 63V. You really need to give voltages for the electrolytics. Also, just what size is a “proper” heatsink? And the power supply of 50v total x 4A would be 200w: wouldn’t half that be plenty for a 40w output?